Traveling is something that I used to fear, but now crave. We won an amazing vacation to Roatan Honduras, and I cannot wait to go!! 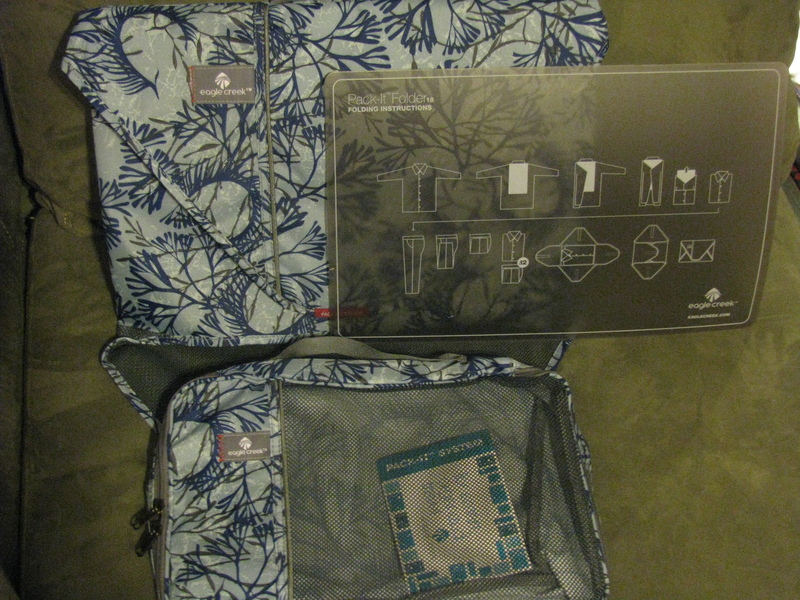 I was super excited to receive the great Pack It World Traveler System Set from Eagle Creek to review. It is my favorite color, blue, and perfect for organizing for my special trip. I love being organized, and a am a bit OCD. Traveling will be simpler, and much more exciting with an organized suitcase to place everything in. I will also have more room to bring back souvenirs for my son. With an organized suitcase I hope to put everything in carry-on and save us money. Later this year I also hope to travel to Chicago to visit my sister. So many fun reasons to use these fabulous products, and now that I have them, I keep thinking of more. No matter how often you travel, being organized and having the correct supplies to get you to your destination are essential. Eagle Creek’s travel set contains a Pack It Folder for shirts, blouses, slacks and sweaters, with a special board to help you fold them so they don’t wrinkle. There is also a Pack It Cube that holds anything that you can roll, including undergarments, t-shirts, shorts, and pj’s. The Pack It Pouch is the perfect size for toiletries, cosmetics, or in my case, medications. There are also many other fabulous products available on their website. You can purchase this set from Eagle Creek for $40 or come back for our giveaway to win your own set. Great review. I love this luggage, it’s so nice! this travel system is very economical. I need to be more organized when i travel! thanks for sharing this! Thanks for the review. I like the additions they have to help you roll items and flatten things out to prevent wrinkling. I hate wrinkled clothes. Sounds like a great system to own. So clever I love it great review. I love that it don’t wrinkle, i need a set of these-thanks for sharing. I love the look of the bags! Ooo I like the design and it looks very lightweight and easy for organizing. I love to be organized, especially when I travel. This system looks like it would be the key to organization. I love the instructions that come with the system – I am one that needs instructions. I love the fact you can fold your clothes and hey do no wrinkle. What a blessing to win a vacation and accessories to go with it! 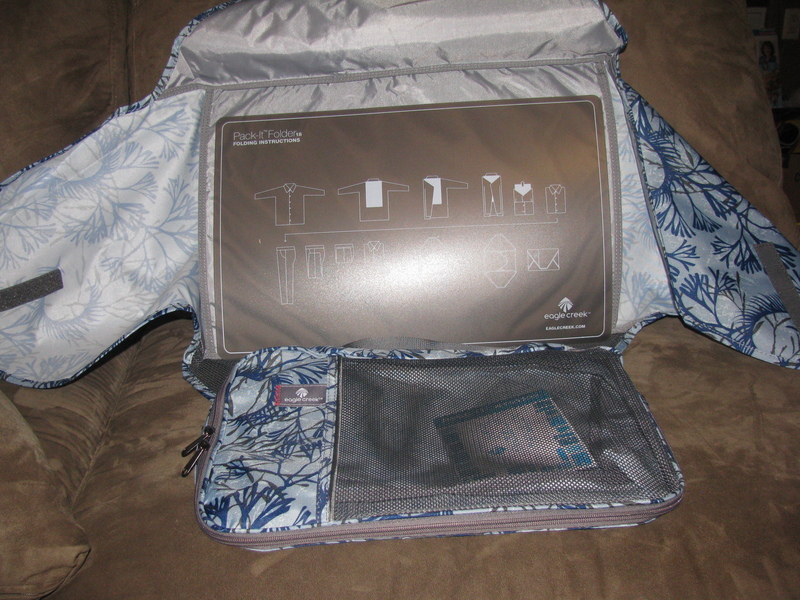 I really like this travel system…it makes traveling so much more organized. A must have! That luggage set is gorgeous and looks like it would last for a long time. It looks like a very nice luggage system. I like the way they give you tips on how to use the luggage. Plus it is very pretty! I love that board with instruction diagrams to keep things neat. I love eagle creek and these tools are so well thought out and I need some! I travel fairly regularly and would love to try this system. I like that it has a board to keep shirts from wrinkling, and the pack cube is also helpful to stay organized. I always over pack and no to organized,this will keep me on track. SO CUTE! I totally need a new set of luggage, and a place to go! I love the EC Adventure 4 wheel 28″ suitcase. So big and roomy and easy to maneuver, it would be a dream when traveling! I love these! Thanks for the review. I love the no wrinkles!!!! Great review. This is a “must have” to travel.